It’s been a little over a year since Rick Springfield’s guitar tech Ruben Velasco died of cancer at age 41 and a project in honor of his love for cats is under way in his memory: The R.V. RV Cat Mobile. This RV – a play on his initials and actually an RV – will be used to transport cats (and dogs) during emergencies, for adoptions and to schools for educational programs. According to the Indigogo site describing the project, the RV was purchased through Rick Springfield’s Ruben Velasco Legacy Fund – the one created last year that offered a backstage experience that included being an honorary guitar tech backstage at RS shows last summer. 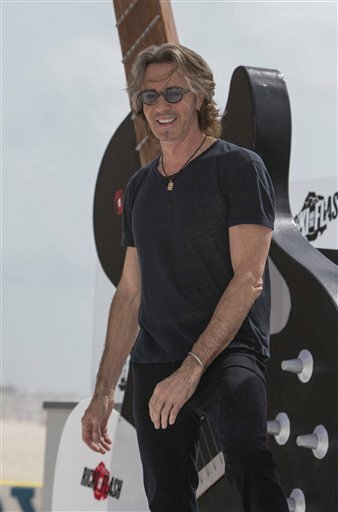 According to rickspringfield.com, the fund collected $47,000 in donations from RS fans and minus the cost of marketing and the cost of the guitars and other goods provided to those that purchased the backstage experience, a total of $35,576 was donated to the Fur & Feather Animal Sanctuary, the organization that purchased the RV and plans to modify it for this special use. The campaign goal is $25,000 and when people contribute to the fund, they qualify for special gifts. The Rick Springfield-related ones are signed Rick Springfield photos and “Still Rockin for Ruben” T-shirts. For the full list of prizes and more information about the RV and the Sanctuary, visit the Indigogo site: The Sanctuary Cats R.V.- RV Needs CATification!